David Cooper is a third generation French horn player having both his uncle and grandmother as professional horn players in the Lansing Symphony. He began playing with Michigan State University ensembles when only 15 and was in the top MSU ensemble at age 16. While studying at the prestigious Curtis Institute of Music David was awarded a Tanglewood Fellowship, and spent the past 3 summers at the Marlboro music festival in Vermont. 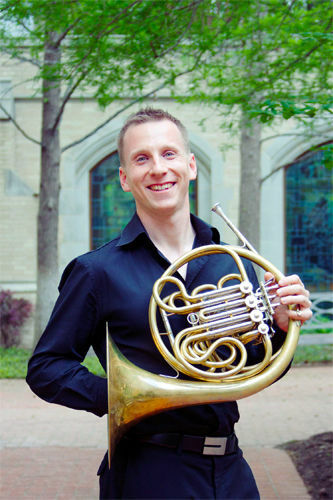 In 2013 David won Principal horn of the National Symphony in Washington D.C. but was soon after as appointed Principal horn of the Dallas Symphony in May of 2013. He has been with the Dallas Symphony as 3rd horn since 2011. David served as acting principal horn with the Victoria Symphony in British Columbia and associate principal horn the Fort Worth Symphony, and was guest principal horn of the London Symphony Orchestra, Hong Kong Philharmonic, and Saint Paul Chamber Orchestra. David is an active chamber musician and is currently the Music Director of the Avant Chamber Ballet in Dallas, TX.